Mayor Martin Walsh hopes that the sale of the massive Boston Globe property on Morrissey Boulevard will result in a new mixed-use development that will follow guidelines laid out by a city-led task force four years ago. John Henry, the owner of the Boston Red Sox, purchased the Globe and its assets – including Worcester’s Telegram & Gazette newspaper – in a $70 million deal executed last October. He has since sold the Telegram & Gazette and contracted with Colliers International, a commercial real estate firm, to solicit bids for the Globe’s headquarters, which have been located in Dorchester since 1958. Henry and his executive team intend to move the Globe’s editorial, advertising, and office staffs to a new, smaller location in the city, probably in the city’s Seaport district, according to published reports. The newspaper’s printing operations would be relocated to a separate site, the story goes, with a plant in Millbury that the Globe owns a likely prospect. Tom Hynes, the CEO and co-chairman of Collier’s Boston office, told the Reporter that the Globe began accepting proposals from potential buyers in mid-September. This followed a series of on-site tours throughout the summer and a “global marketing campaign” to seek buyers. Hynes said that the Globe did not set an asking price. Hynes would not say specifically who might be included among the finalists. Michael Sheehan, who was hired by John Henry to serve as Globe CEO last year, would also not talk specifics about who might buy the Globe or when a decision could come down. “From the bids we saw, I think everyone came back with the [Columbia Point] master plan in mind,” said Sheehan. The 16.42 acre property at 135 Morrissey Boulevard is dominated by the three-story, 815,899 square foot building that houses the paper’s editorial, advertising, and administrative department along with its production facilities and several substantial parking lots, one of which comprises 600 space and abuts the “over-the-bridge” neighborhood of Savin Hill.The building has been updated twice, in 1962 and in 1995, through renovation projects that expanded its footprint. Another environmentally sensitive and immediate neighbor to the Globe property is Patten’s Cove, a marshy, urban wild that is connected to Dorchester Bay through a culvert that runs under Morrissey Boulevard. The cove’s status doesn’t rate a single mention in the Globe’s real estate prospectus. In an article published in the July issue of CommonWealth magazine, Globe CEO Sheehan said he expected that the new buyer would lease the Morrissey Boulevard building back to the Globe for a period of three years while the newspaper arranged for a new home – a requirement confirmed in an “investment offering” prepared by Colliers and obtained by the Reporter. “It’s a perfect site for mixed use, for an urban Legacy Place, like in Dedham,” Sheehan told CommonWealth. 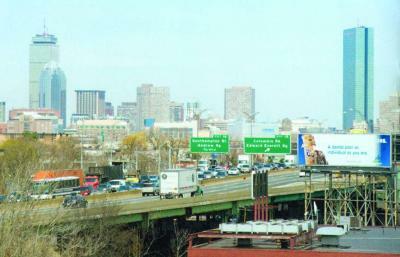 When pressed on why the Globe would not stay in its present Dorchester quarters, Sheehan said he wanted the newsroom closer to downtown Boston. “Aren’t you close now?” asked the interviewer, Bruce Mohl. “Not really, we’re close to Quincy,” replied Sheehan, who said the Globe would “love to be in the Seaport area” or close enough for employees to walk to South Station. This week, in an interview with the Reporter, Sheehan declined to rule out any site for the Globe’s next home. EDITORIAL: Globe is on the move; but why not stay in Dorchester? The prospectus prepared by Colliers describes the Morrissey Boulevard site as “an extremely rare large-scale urban redevelopment opportunity” and trumpets the site’s visibility to commuters on the Southeast Expressway and its “five-minute walk” to the Red Line. It also notes, perhaps in a nod to Mr. Sheehan’s favored transit node, its “six-and-a-half minute” ride time to South Station. Allowed uses, the prospectus notes, can include office space, day care centers and restaurants as of right; other uses, like multi-family housing, hotels and bars would need approvals from the city. Two uses are strictly forbidden at 135 Morrissey Boulevard under the zoning code: dormitories and stadiums. A community task force appointed by Mayor Thomas Menino and supervised by the Boston Redevelopment Authority (BRA) established these zoning rules through a master plan for Columbia Point that includes the Globe site that was completed in June 2011 after a rigorous four-year public process. The plan also addressed height and density, suggesting that taller 11-to-13 story buildings could be situated nearer to the MBTA’s JFK-UMass station, with smaller, six-story structures closer to the present-day Globe site. In a September opinion article published in the Reporter, Don Walsh, who chaired the Columbia Point Task Force, urged his fellow Savin Hill residents to stay alert to the Globe’s impending sale. The master plan has already seen some of its intended development targets scaled back. A 278-unit apartment complex slated to be built on a long-empty parcel next to JFK-UMass station won BRA approval in 2013; but the two planned buildings next to the station will rise only five stories, well beneath the height limits outlined for the parcel in the master plan. Criterion, a real estate management firm, bought the rights to build the $60 million Residences on Morrissey project from the original developer, Synergy Investment & Development last June. Synergy’s owner and CEO, David Greaney, remains a key player on the Morrissey corridor. He retains control of the Star Market building and its next-door neighbor to the south, the Greater Boston Media building. “We will continue to be large stakeholders on Morrissey Boulevard and we have a vested interest in the successful completion of this project,” said Greaney, who is not among those vying to buy the Globe property. Meanwhile, automotive mogul Herb Chambers is another interested party. Chambers, a Dorchester native, bought the old WB56 property next to the Globe in 2012 and advanced a plan to turn the old TV studio into a pre-owned BMW dealership. Chambers won approval for the plan from local civic leaders and the BRA, but has done no ostensible work to advance the dealership since Henry bought the Globe. Chambers has not responded to several inquiries from the Reporter seeking information about his plans for the site. In the interview in his City Hall office last week, Mayor Walsh said that he expects issues of height and density to remain controversial despite the preferences outlined in the master plan. “One thing the master plan called for is density and 17-story buildings and I personally know the community is going to resist that because it’s going to feel too dense,” said Walsh. “We have to look at height. We can’t be afraid of height. We’re used to the Globe there at four or five stories. That’s probably going to change.